Café aromatiséThere are 5 products. 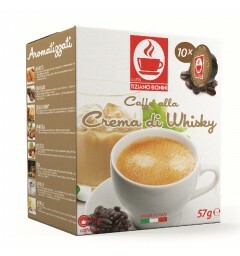 10 capsules flavored with whiskey cream compatible with Lavazza A Modo Mio® coffee makers. The aroma of this capsule is full-bodied, typified Italian coffee, sumptuously accompanied by notes of caramel. 10 compatible almond aroma capsules compatible with the Lavazza A Modo Mio® coffee makers. This flavored capsule is a wonderful combination of taste, between the flavors of Italian coffee and the sweetness of the almond. Clean your Lavazza Modo Mio coffee maker very easily with the Caffenu capsule. 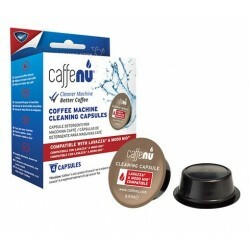 (box of 4 capsules)Caffenu capsules allow cleaning of your Lavazza Modo Mio in depth. Simply insert the Caffenu capsule and turn on your coffee maker. Active foam is released and cleans all residues in the brewing chamber so your coffee maker is nickel. 10 Capsules compatible Lavazza A Modo Mio® hazelnut flavored. 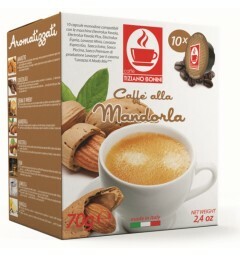 This perfect blend of Italian flavored coffee with the sweetness of the hazelnut is simply irresistible. 10 capsules flavored with macaroon flavor compatible with Lavazza A Modo Mio ® coffee makers. 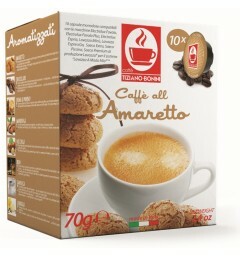 Sumptuous Italian coffee capsules flavored to perfection with this sweet macaroons.